A strange, newly discovered particle could shrink a laptop computer's hard drive to the size of a peanut and an iPod's drive to the size of a rice grain. The particle, called a skyrmion, is more stable and less power-hungry than its conventional, magnetic cousin. Besides storing data in ultra compact media, skyrmions could lead to faster computers that combine storage with processing power and usher in smaller and smaller devices that have the same computing power as a desktop machine. Kristen von Bergmann and her colleagues, led by Roland Wiesendanger at the University of Hamburg in Germany, report their findings in today's issue of Science. While the name sounds like an evil creature from a fantasy novel – it comes from Tony Skyrme, a British physicist who first theorized the particle's existence in 1962 – skyrmions are tiny magnetic fields that surround groups of atoms. Magnetic fields are the basis for data storage. In an ordinary magnet, the spinning electrons inside the atoms all line up the same way, and that's what makes the magnetic field. Those fields embedded into a metal alloy are what make up the 1s and 0s, the bits, a computer data. But these bits must have some space between them in order to function well. Put them too close together and the magnetic fields start to "stick" to each other, messing up the data. 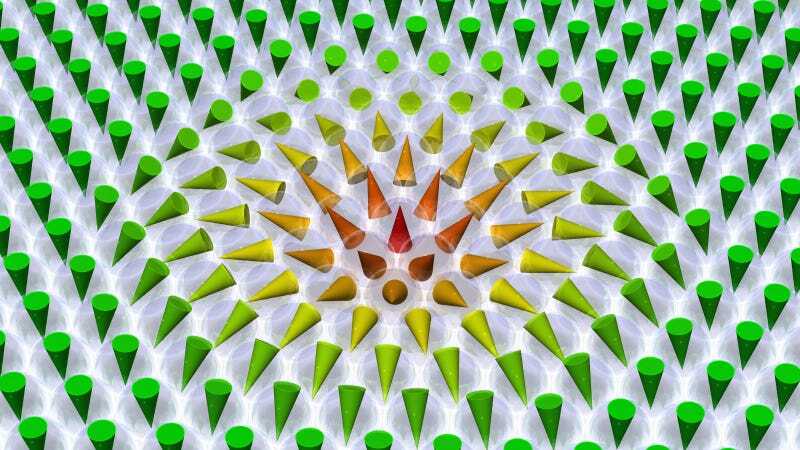 Inside a skyrmion particle, however, the spinning electrons point in different directions, making it more difficult for the magnetic fields to stick together when they get too close to each other. In fact, von Bergmann and her colleagues were able to space the skyrmion bits just six nanometers apart. The best magnetic drives have bits spaced about 25 nanometers apart. In the world of electronics, the more tightly packed bits could translate into a hard drive for an iPod Classic shrinking from about two inches across to length of a grain of rice. Skyrmions get close to each other without interfering with one another, a critical function for data storage. To make the skyrmions, the researchers put a two-atom-thin film of palladium and iron into a magnetic field and cooled it to nearly absolute zero. Immediately, skyrmions appeared on the film. Next, the researchers fired a beam of electrons at the film. The electrons annihilated the skyrmions. Firing that same kind of current at the film again made the skyrmions reappear. The action was similar to reading and writing data onto a magnetic film, with a skyrmion counting as a "1" and its absence counting as a "0." Now that the scientists have shown it's possible to read and write data using skyrmions, the next step is making a practical data storage device. Von Bergmann said the challenge will be finding materials that can make skyrmions at room temperature. If they can do that, the skyrmion-based bits should be more stable than their ordinary cousins. The same quality that enables them to come close together without interference also make them less affected by heat, a typical problem in magnetic drives. Skyrmion-based electronics wouldn't just be smaller and more stable — they'd use less power, noted Avadh Saxena, a physicist at Los Alamos National Laboratory. In fact, the skyrmions require 100,000 times less power to manipulate than magnetic fields on a hard dive. One factor that bodes well for building real drives is that the researchers didn't need to use any exotic substances for the magnetic film. "It's exciting that they used relatively conventional materials," said Ulrich Rössler, a physicist at the Leibniz Institute for Solid State and Materials Research in Dresden, Germany. This post by Jesse Emspak originally appeared at Discovery News. It has been republished with permission. Images courtesy R. Wiesendanger, University of Hamburg.